Guess who’s back…back again…Fatboi’s back…tell a friend. It is I, Jess, the ghost of Christmas past, coming to you after a year-long WordPress hiatus. In the past year, I started grad school and have been grinding it out, while Christie’s been managing a sports facility and running 23812947 Spartan races (aroo!). 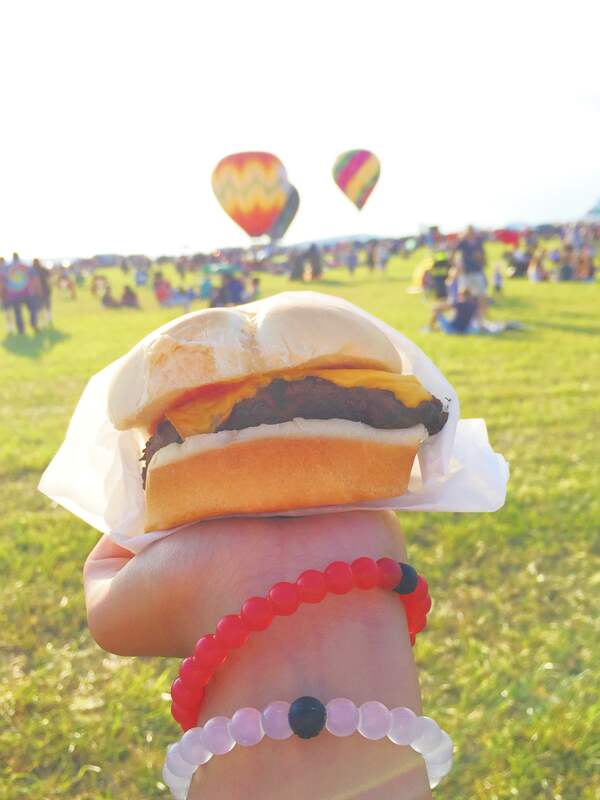 But don’t worry, we’ve been just as committed to the #fatlyfe. July 14th kicked off restaurant week in New Brunswick, NJ. ‘Til the 28th, the hottest spots are offering discounts on beverages, meals, desserts, and everything in between. 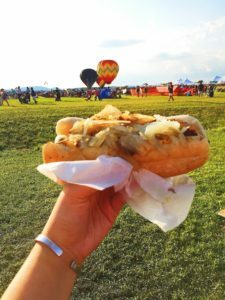 From ramen to Ethiopian cuisine, to jam-packed strombolis at Stuff’s, there’s something for everyone. 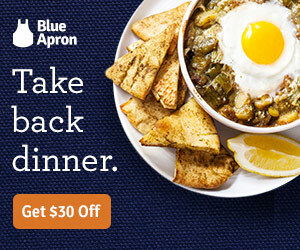 It’s a great excuse to have a fancy date night, dinner and drinks with the girls, or a family outing. 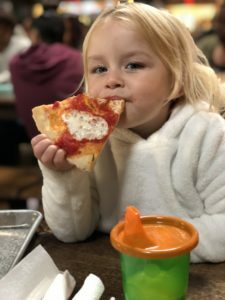 I decided to give Catherine Lombardi a try, after hearing great things about their Italian fare. I easily mapped out my prospects from their $39 three-course menu, prior to even setting foot into the building. I rolled out of bed, changed, and headed to Catherine Lombardi accompanied by my childhood friends (s/o to Marce and Cee, the OG’s). Scoping out the restaurant, I quickly regretted my outfit choice. I looked like a fat baby who got separated from her nanny, in my floral jumpsuit. Wine glasses and fancy linen napkins dotted every table, and everything was RED; the walls, the velvet curtains, the carpet, the upholstery. It was what I imagine entering Christian Grey’s red room of pain would feel like, but not as terrifying. 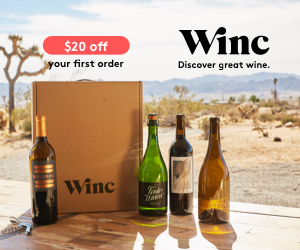 I dove right into the wine menu (overwhelmed by the number of categories I never knew existed) and zeroed in on my go-to, Pinot Grigio, and ran with it. For starters, I ordered the Caprese salad with house-made mozzarella. Tomatoes are either a hit or miss for me, but I easily chowed them down, and the house-made mozzarella was divine. I’m obsessed with anything and everything truffle, so I had to go with the Garganelli with truffle cream, prosciutto, and asparagus as my entrée. The prosciutto was the perfect addition, balancing out the truffle flavor. Marce opted for the linguine with shrimp scampi. Obviously, I stole a bite, and it was a delicious rendition of the Italian classic. 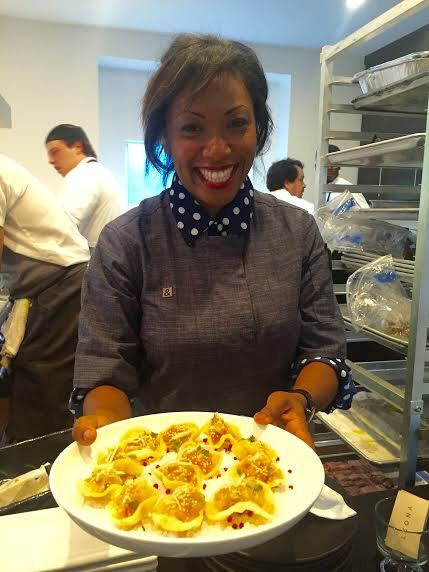 Cee chose the tortelloni with Parmagiano-Reggiano cream and bolognese sauce. We actually had to google if tortelloni and tortellini are the same and *spoiler alert*, they are. I may have an Italian last name, but I had no idea wtf was going on. You may be looking at this picture thinking, ‘What gives? There are only 6 tortellonis.’ I thought the same thing until I sampled some, and the tortellonis were stuffed with filling, making it a reasonable portion size. To round out my trifecta, I opted for the mascarpone cheesecake. It was incredibly creamy and tasted flan-like. Marce selected Mrs. Palmisano’s cookie plate. To our delight, the cookies were melt-in-your-mouth soft and delicious. This plate would make any Italian grandmother beam with pride. Cee went for the mango sorbet. It didn’t knock her socks off, but I was pleased with the refreshing zing. Not only was the presentation on point, but the food quality really knocked it out of the park. 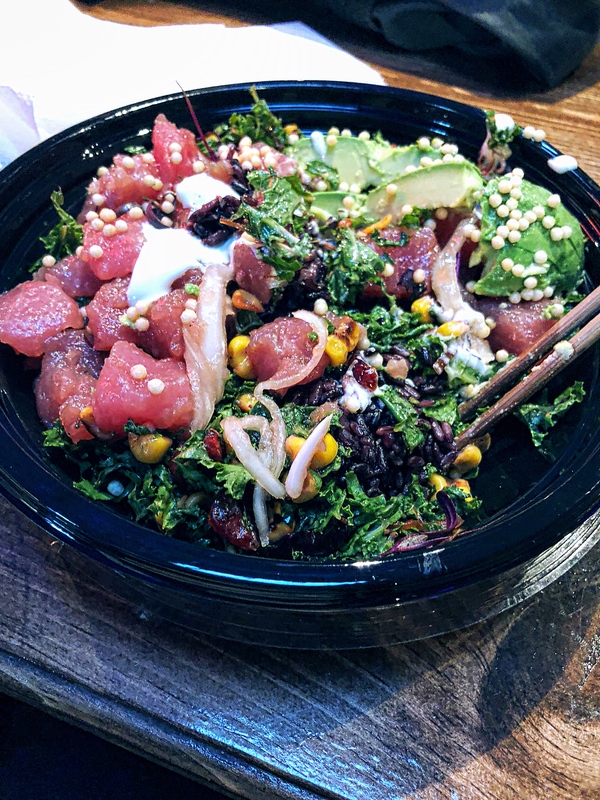 All of the ingredients were incredibly fresh, making for flavorful dishes. It was fun pretending to be bougie for a night, all under the guise of a discounted prix fixe menu. R/10 Social House on Redondo Beach Pier is a two-story restaurant with fantastic views of the ocean, marina and pier! After brunch, take a stroll on the pier to walk off your delicious, yet-oh-so-filling, meal! Brunch is a staple here in the DMV. 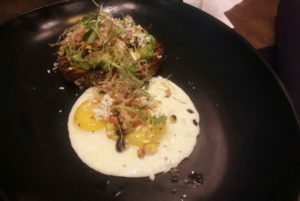 On Saturday and Sunday mornings, hundreds of residents stumble out into the streets looking for the best brunch cocktail, and a comfort dish to cure their lingering hangover! 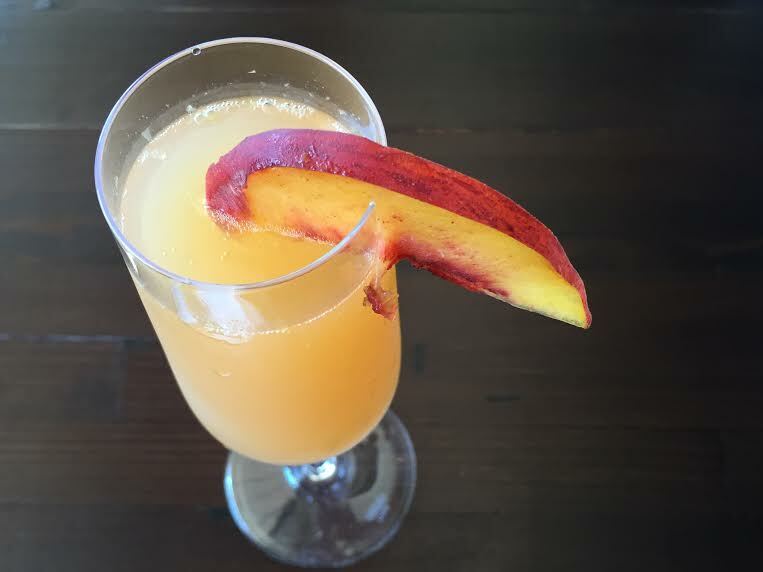 With so many options to choose from, restaurants work hard to stand out and provide menus and offerings that will leer the mimosa craving patron into their doors. For the DMV, a good brunch isn’t just a meal, it’s an experience. I can make brunch dish at home, but I can’t make an Arepa Eggs Benedict with an art gallery as my backdrop now can I? That’s where Palette 22 steps in. Palette 22 gets the experience of brunch right. 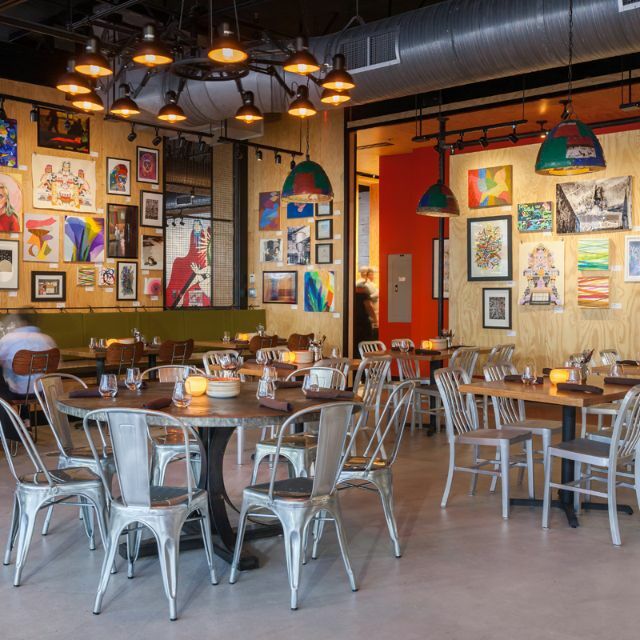 It’s a restaurant as well as an art gallery. On any given day, local artists can usually be seen working in the space and almost all of the art shown can be purchased. I loved walking in and checking out some of the pieces while we waited for our table. Though I didn’t buy any, there were a few I put in my mental wish list. Who doesn’t love brunch? Better yet, who doesn’t love eggs?! 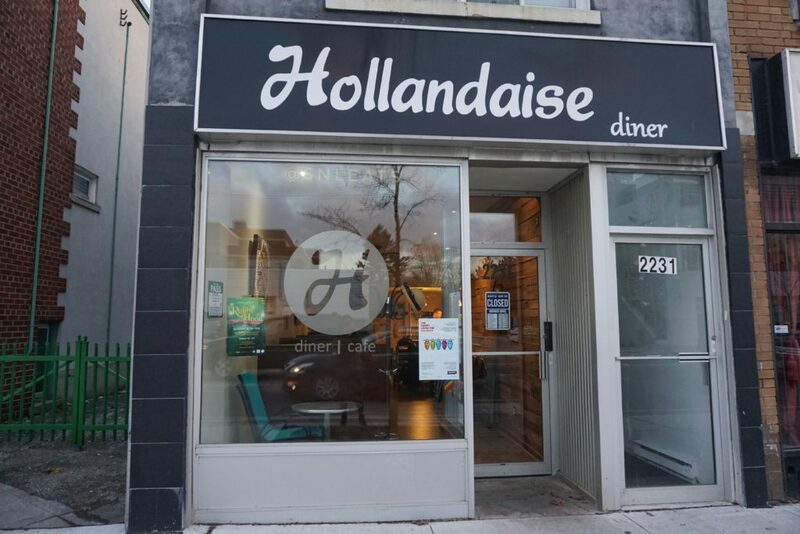 Hollandaise Diner is a brunch spot along “The Danforth” in east Toronto that specializes in brunch seven days a week from 7 am to 3 pm. They are even open on CHRISTMAS DAY for your Christmas brunch needs! This east end diner owned and operated by a very proud “east ender” couple who show their love for this diner in all their dishes by preparing them fresh from scratch every morning. This diner may be small (well, it is a diner!) but, in my opinion, is worth the wait! 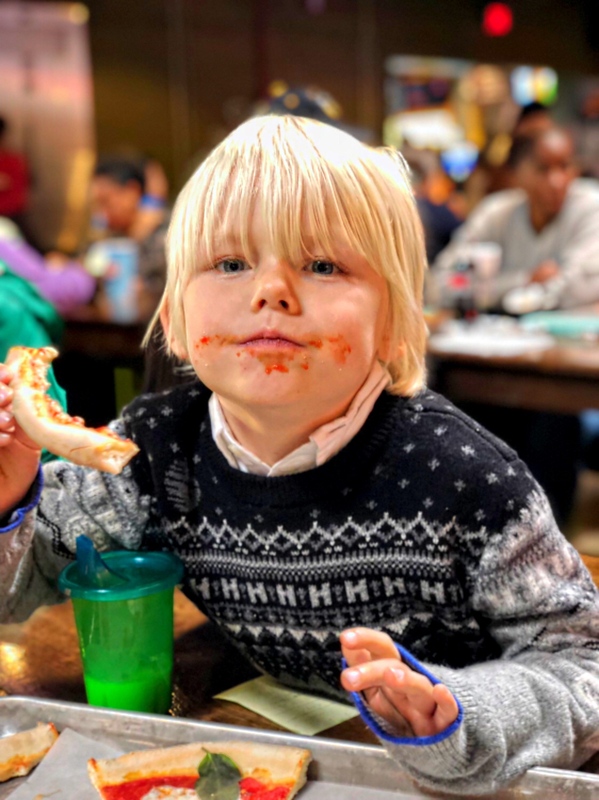 This diner serves a multitude of various breakfast dishes, ranging from buttermilk coconut pancakes to frittatas to a build-your-own eggs benedict. Their menu is endless! Oh, and their homefries are NOT deep fried! 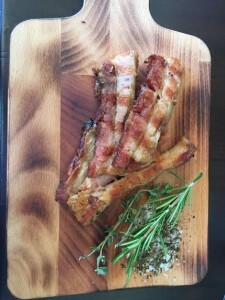 They may taste as crispy and yummy as if they were fried, but they are cooked on a flat top! 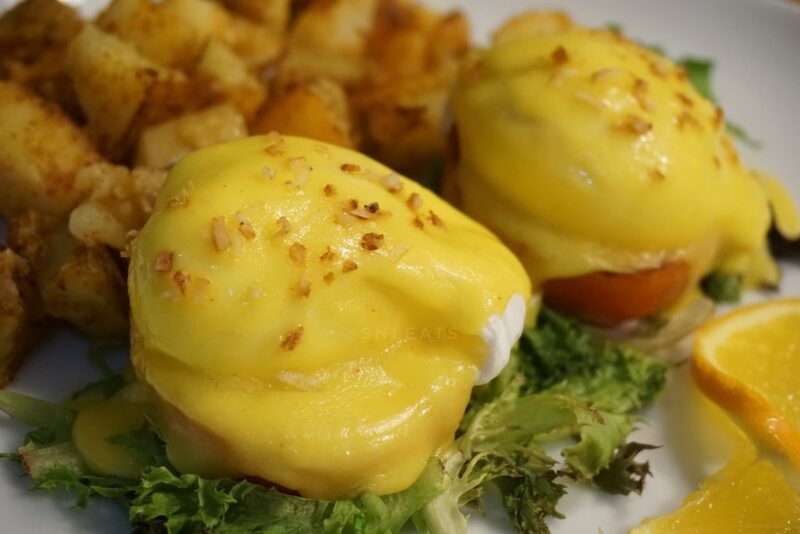 Just as their diner is named, hollandaise sauce is their specialty. Their hollandaise sauce is made fresh from scratch daily, and they even offer five different hollandaise sauces (original, HP infused, zesty, coconut and Cajun) which give their diners a different experience each visit. 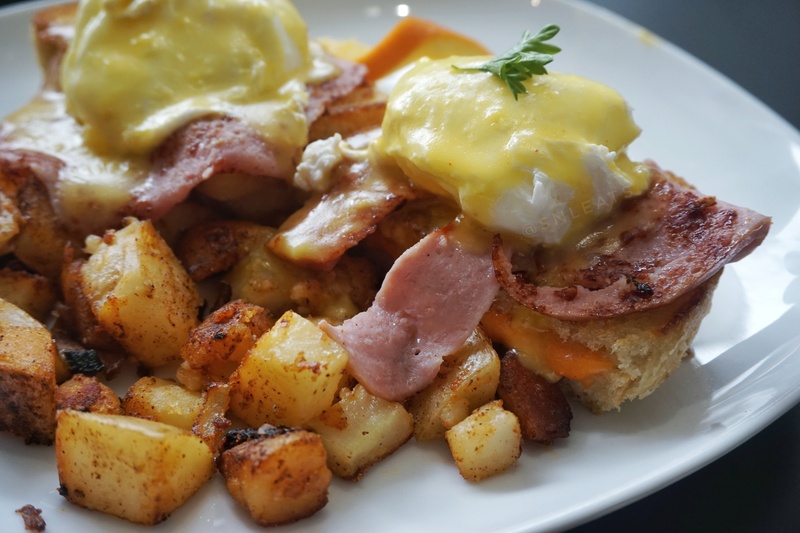 I have had the opportunity to sample a multitude of their eggs Benedict creations, and it ‘s hard to pick a favourite. I would say that “The Meatloaf” eggs benny is one I would keep coming back for. 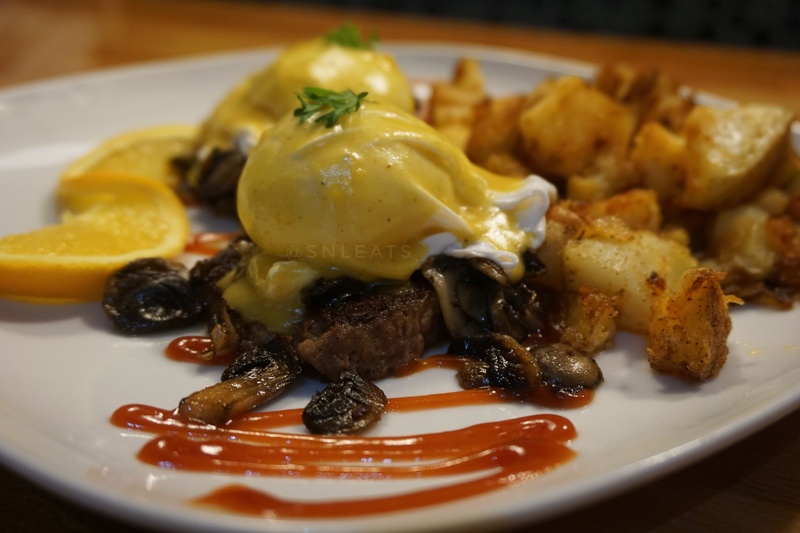 This benny consists of two pieces of homemade meatloaf, ketchup glaze with sautéed mushrooms, two poached eggs and their HP infused hollandaise sauce. This creation is definitely over the top and is such a homey dish. Meatloaf, in general, can be a bit dry or even taste, well, like plain meat but at Hollandaise Diner their meatloaf is super moist and is seasoned perfectly. Another benny I would go back for if I wanted a lighter option would be “The Coconut.” This benny consisted of grilled tomato on top of bitter greens, two poached eggs, their coconut hollandaise sauce and topped with toasted coconut. This dish a vegetarian variation of an eggs benedict and I would grab it in a heartbeat. You may think that having coconut in a dish may make it sweet, but somehow they magically were able to create this sauce without being sweet yet have that coconut flavour you’d be looking for. The last thing I would probably go crazy for is their buttermilk pancakes. Man oh man, did I devour this stack you see. I was super stuffed when I tried these dishes, but somehow I got myself to stuff all of this in my face, and I do not regret any second of it! This stack is their coconut pancakes (YES, COCONUT!) with blueberry fruit sauce. 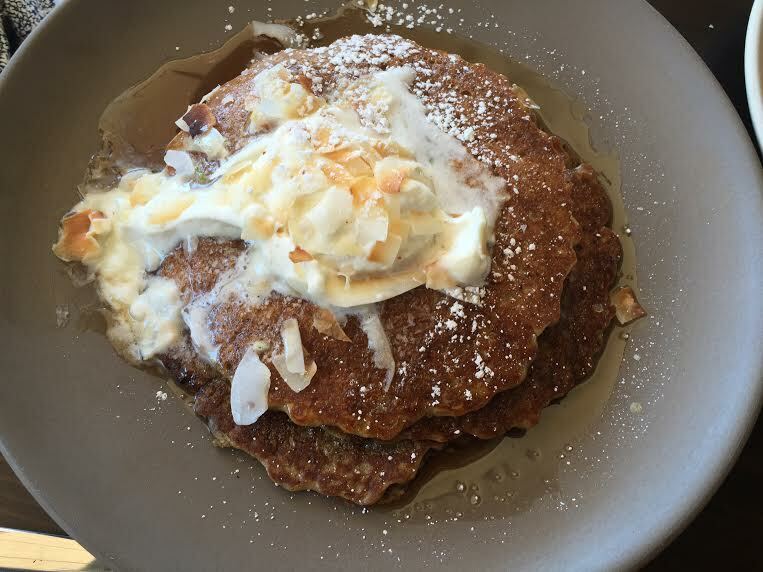 These pancakes not only taste like coconut but they have coconut in them! So when those coconut cravings hit, I know where to go! One last dish I cannot go without featuring is “The Croque Madame.” This benny consists of a grilled cheese, two poached eggs, and their original hollandaise sauce. 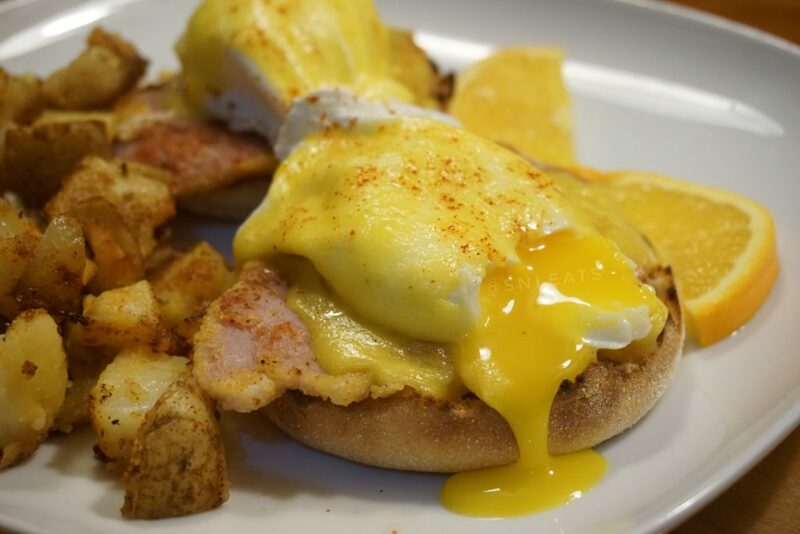 If you love grilled cheese and you love eggs benedict, then you know which benny you should have! 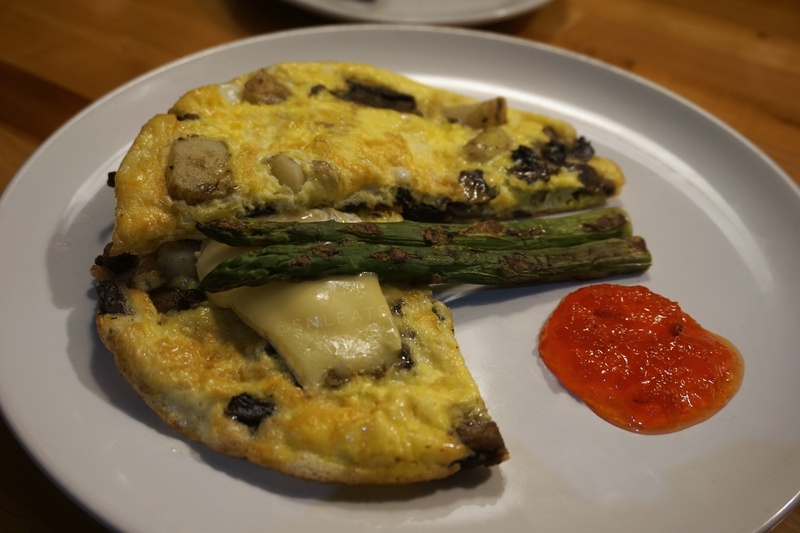 This benny plays to my childhood, and my favourite thing to request (and cook!) was grilled cheese. I wish I thought of this sooner; having the ooey gooey grilled cheese with the creamy hollandaise sauce and the perfect runny egg yolk, it really cannot get any better. Clearly, I do recommend this place, and I would say that it is currently my go-to brunch spot. With all of their fresh and made from scratch dishes, I will be a return customer! I’m terrible when it comes to eating a full breakfast, I’m usually a cup of black coffee kind of gal. But nothing makes me happier than being able to sit down and have a full breakfast that’s tasty and keeps me full all day. Since 1994, Bread and Porridge has been serving up some of the best breakfast on the Westside. 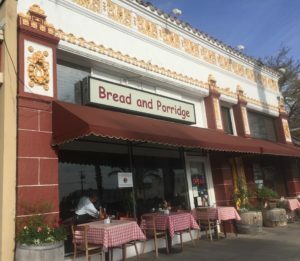 I discovered this place when I moved to LA and thought I’d share with you a couple of my favorite breakfast items in town. Instead of my usual black coffee, I decided to live a little and have a Ghirardelli Hot Chocolate. 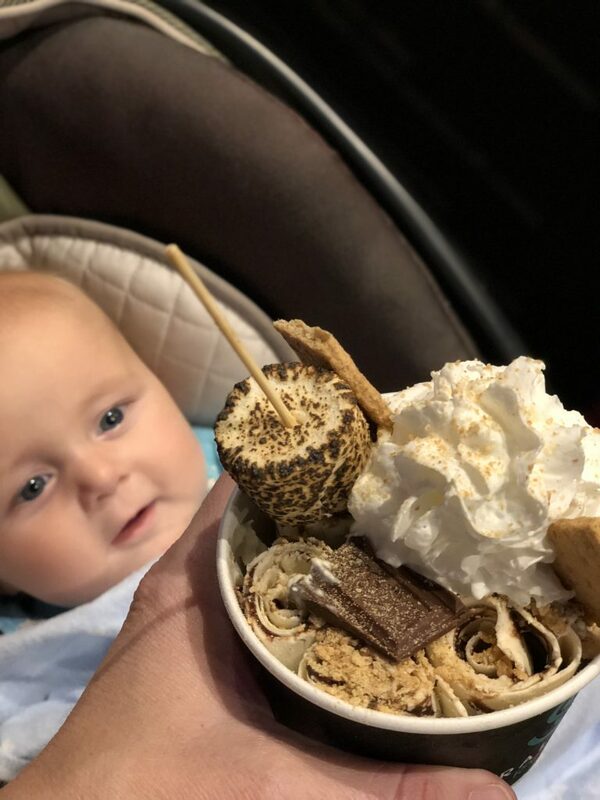 It was topped with an ample amount of whipped cream (just how I always had it as a kid) and totally hits that comforting spot. The Ultimate Breakfast Burrito is my favorite item to get here. Not only is it jam-packed, but they wrap it tight enough so it all stays in the tortilla (major points for that!). 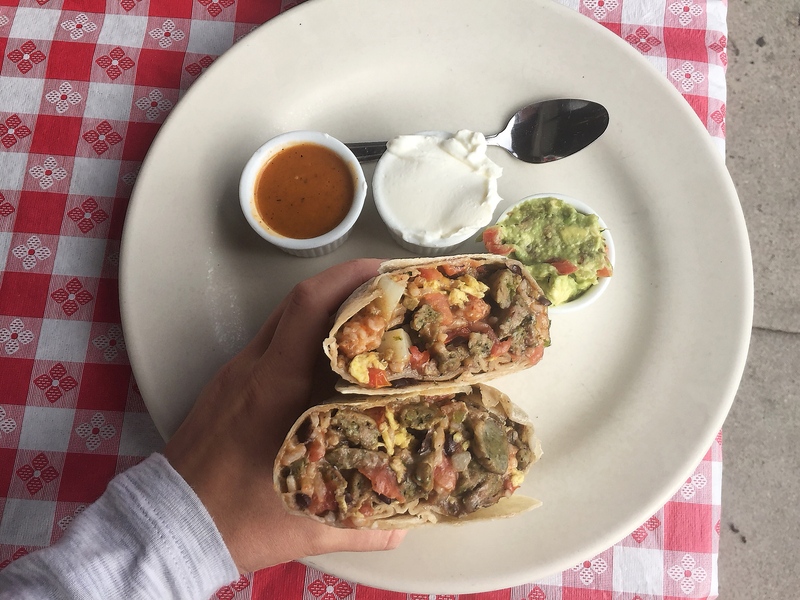 This is a classic breakfast burrito with rice, beans, eggs, cheddar cheese and pico de gallo, and it comes with a side of house-made salsa, sour cream and guac. Editor note – I order it with their Cilantro Verde Sausage, made with turkey and chicken in place of the usual sausage. 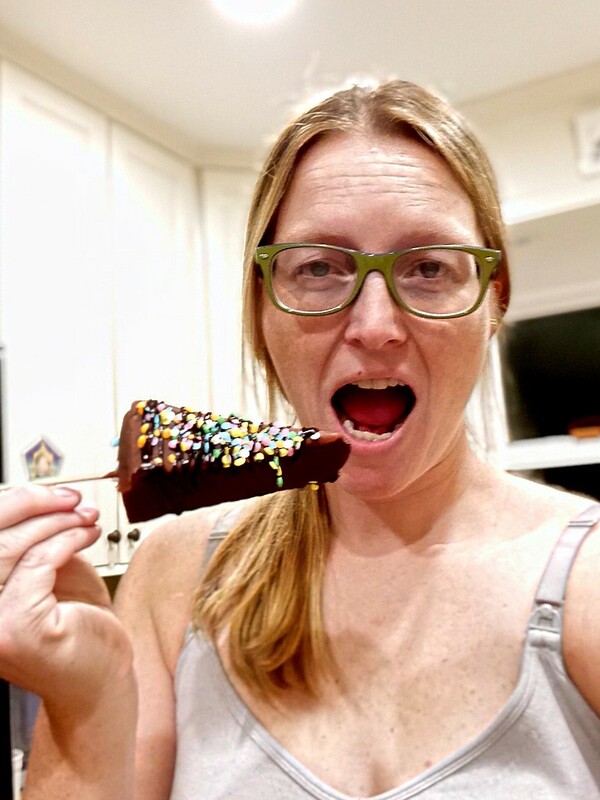 I really went all out with my sweet tooth here! I also got the Original Belgian Waffle topped with strawberries, Nutella and a fresh vanilla cream. I’m a Nutella fanatic, so this treat really hits the spot. If you’re in Santa Monica, be sure to pop in! Like any good toddler mom, I head to Pinterest for basically everything party related! 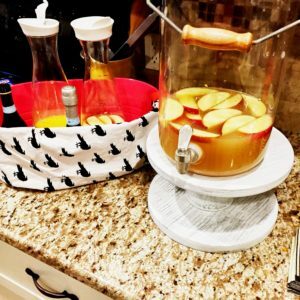 Every month or so, I host a “Boozy Brunch Bunch” because well, if you play with kids all day and never see your friends, there is a chance you will lose your sanity. 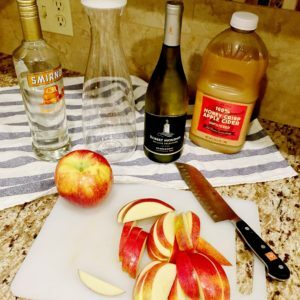 With “Boozy” in the title, I like to have a couple of options available, so thanks to #itsfallyall and Pinterest, I can bring you today’s concoction! 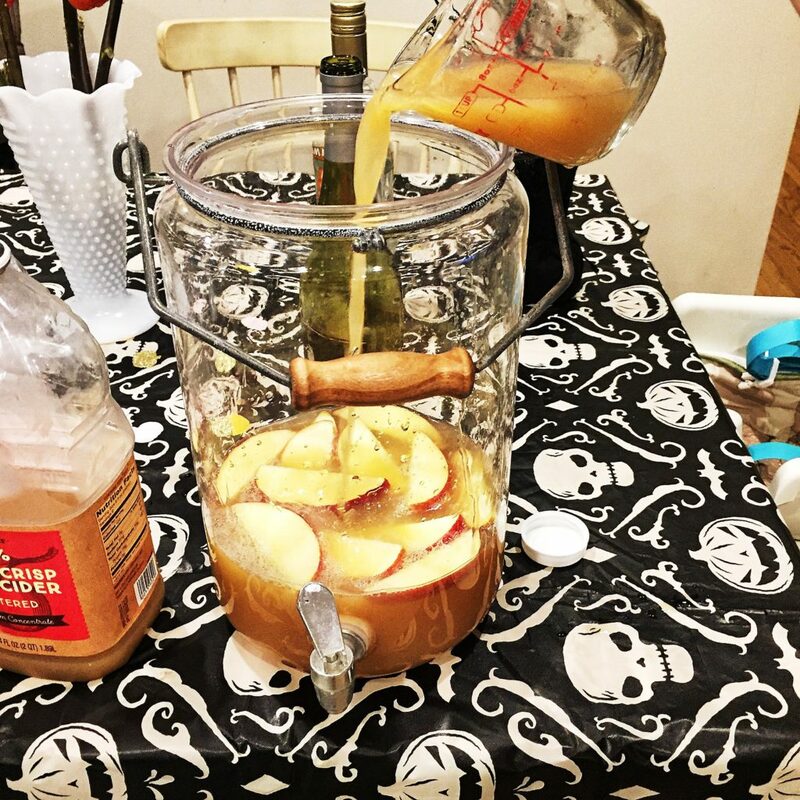 This month, I decided to host a BOOzy Brunch Bunch, because of Halloween. Unfortunately, Raleigh got hit way harder than expected by Hurricane Matthew, and my freezer got wiped out, so I didn’t have most of my normal go-to’s, like all the mini muffins I’ve crafted over the years, or the tiny eggos the kids love so much. (I’m seriously not complaining about this; there are towns in North Carolina that people still can not get into their homes, so my freezer is the least of my worries right now). But since I couldn’t just defrost a handful of muffins and throw eggos in the oven, I started to think about my favorite breakfast foods and realized: toasts are so hot right now! 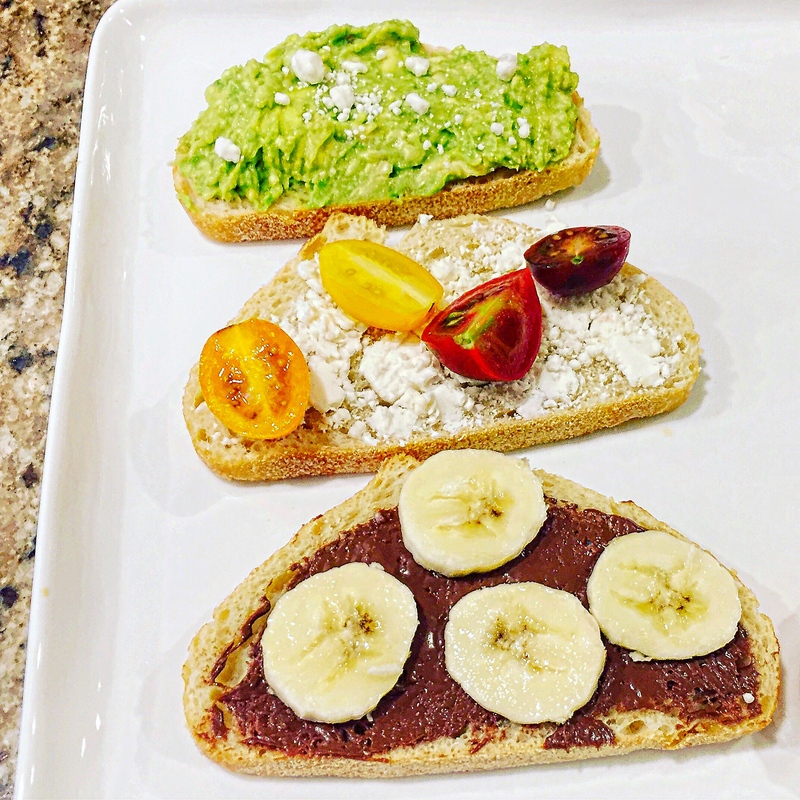 My favorite restaurant up in Rhode Island is called Persephone’s Kitchen, and the owner, Persephone, has a delightful selection of toasts every morning that I decided to emulate. So for the guests at my home, there were avocado and cayenne pepper sprinkled with goat cheese toast, goat cheese and mini heirloom tomato toast, and the gold standard of Nutella and banana slices on toast! 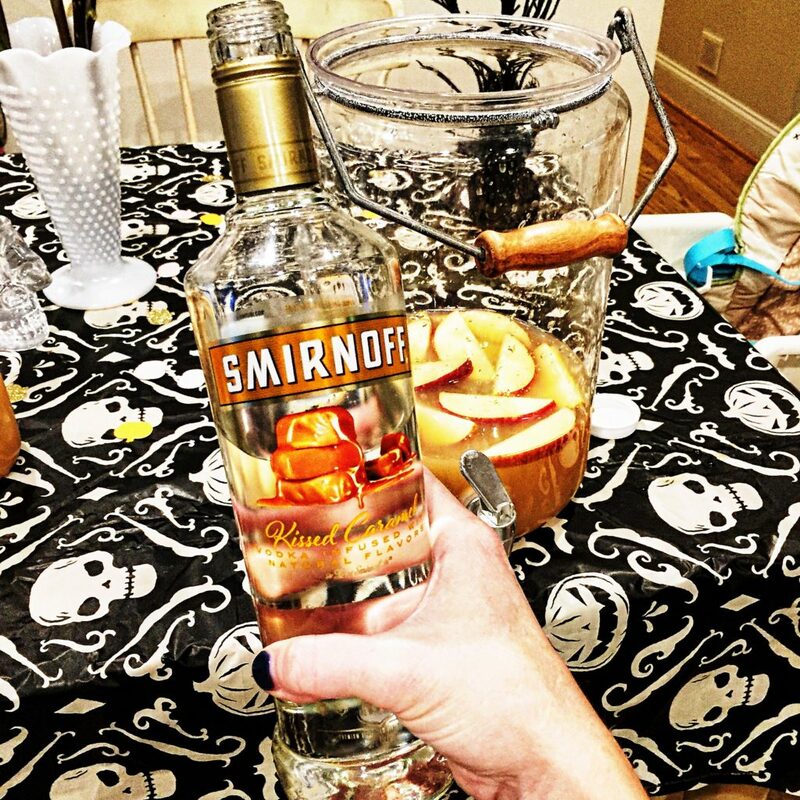 Of course, I provided mimosas and coffee, but I wanted to have a special beverage on hand as well. 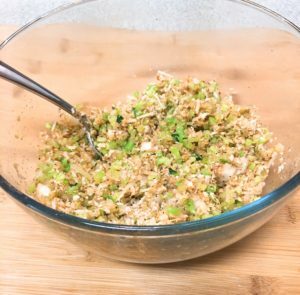 My sister-in-law and I had thrown a joint birthday party for our new one-year-olds at the beginning of October, and we tried this recipe for the first time then. I just knew it had to make another appearance this fall! 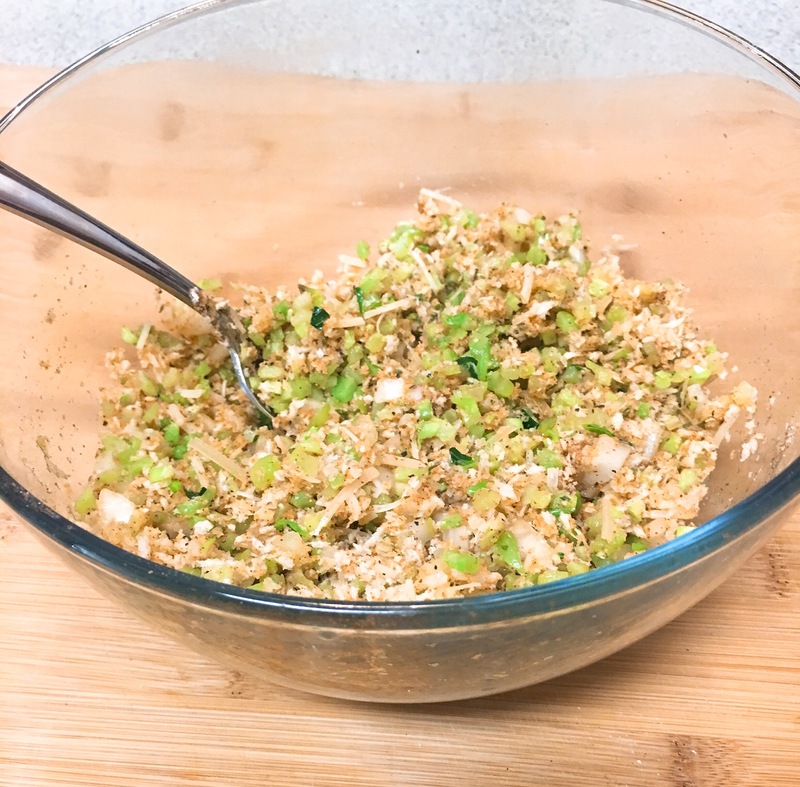 This recipe is super easy and takes 5 minutes to put together! Deceptively sweet, so make sure kids don’t accidentally drink it (a valid concern) and make sure your adult friends know they just got sloshed before you let them hop into a car and drive home! It’s the perfect warm fall day beverage, as the sun is shining and you don’t want anything too heavy! 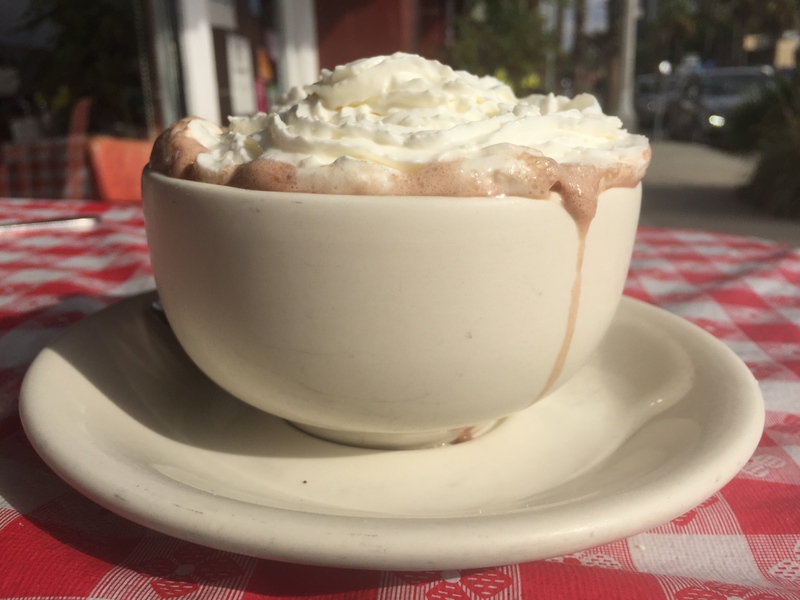 Ideal for a southern fall day, for sure! The first step is to cut up 2-3 apples and add them to your pitcher! I started this in a juice jar, and realized I needed something bigger midway through and transferred! Next, add a bottle of your favorite chilled white wine (I used chardonnay), a container of apple cider (I prefer Trader Joe’s version), and then the coup de grace, is one cup of Smirnoff’s Kissed Caramel Vodka. Everyone who has tried this loves it! 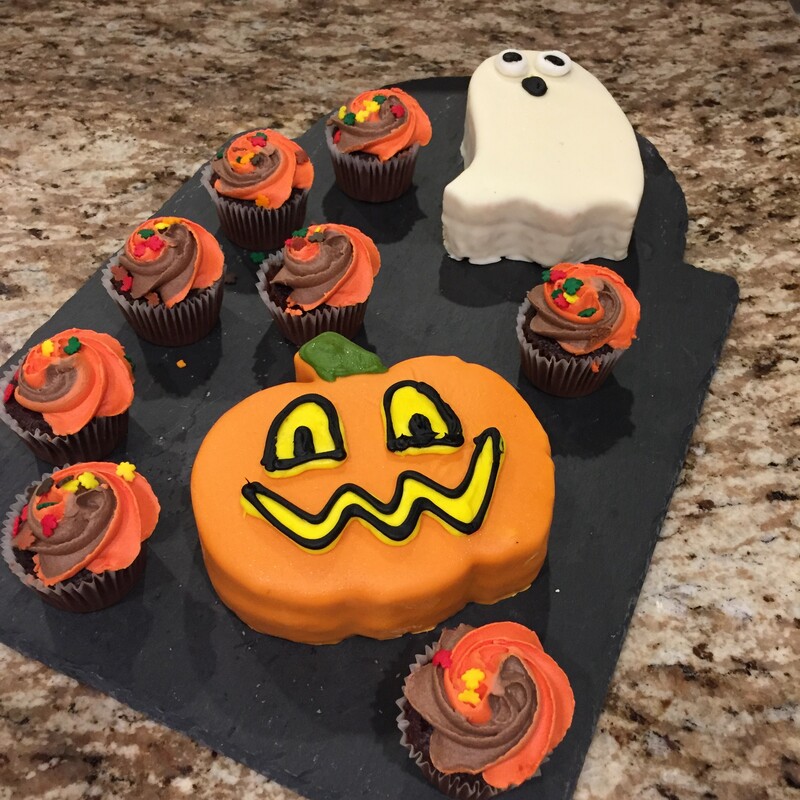 I’m thrilled for the leftovers to share with my neighborhood tonight as the kids are out Trick – or – Treating! YASSSSS!! Fall is officially here! The weather is finally not giving me a heat stroke, I can stomp aimlessly through piles of leaves, I can pretty much get pumpkin anything and football season has started. That means a copious amount of Sunday Fundays is about to go down! 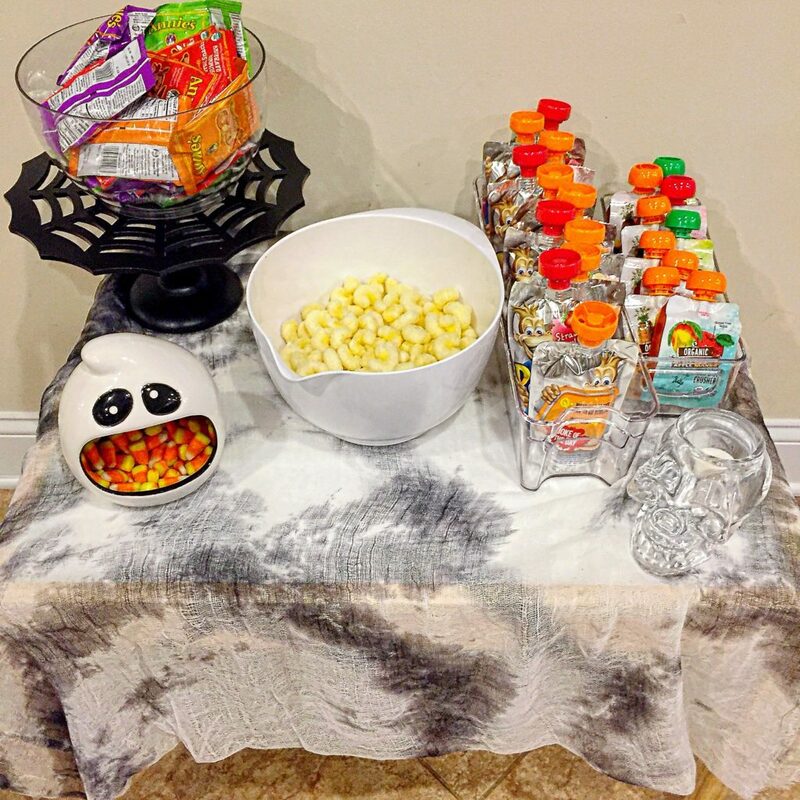 Now I love a good football snack spread just as much as the next person. However, most snacks are fried and smothered with cheese. Like my favorite, tater tots. Since I know I am going to be attending a ton of Sunday Fundays, I cannot be eating all the fried food. ( I want to, but I can’t keep buying new jeans). 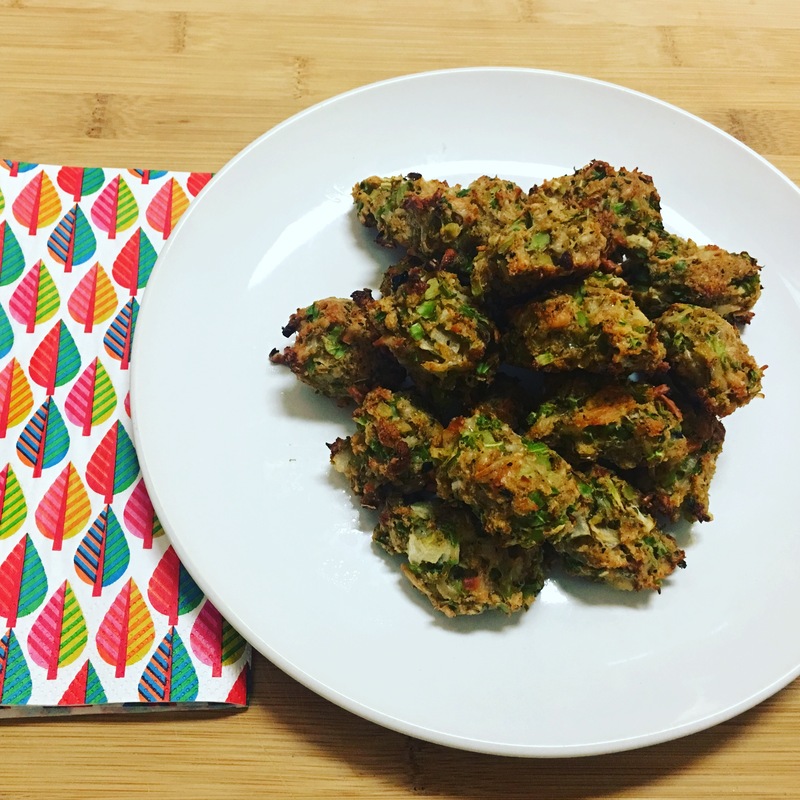 So I decided to take matters into my own hands and make a healthy version of my fave, broccoli tots. I used my cauliflower pizza crust recipe as inspiration, and I have to say what I came up with was freaking tasty AF. So if you want to get your snack on basically guilt free continue reading for my Broccoli Tot recipe. *I give this disclaimer every time but just in case… I do not measure out anything. I just kind of eyeball it with these little bowls and they hold approximately one cup. Blanche the broccoli in a pot of boiling water for 1 minute. Rinse the broccoli with cold water and let it sit while I prepping everything else. Once you are done pressing the water out throw everything together in a bowl and mix well. Now you are ready to form your tots. I am not gonna lie, this was the most time-consuming part and if you don’t like getting stuff all up in your fingernails wear some gloves. Grab a little amount of the mixture on a spoon and squeezed it together in your hand until it forms a tot-esque shape. Place them on parchment lined baking sheet. 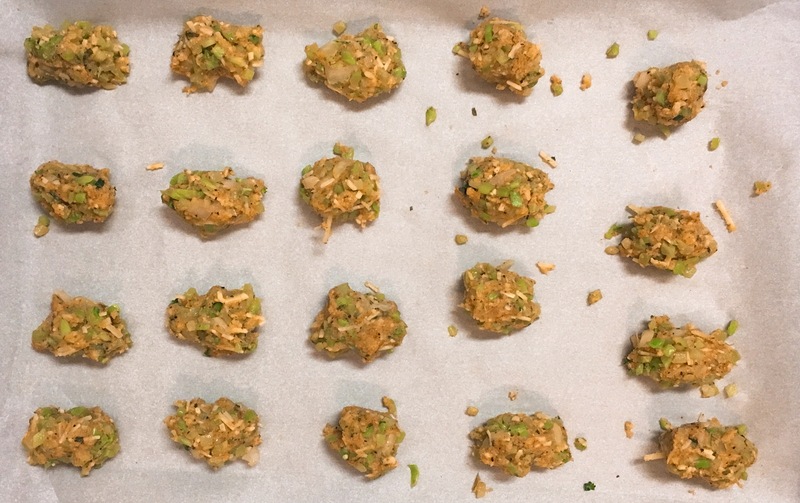 Once you form all your tots, throw them in the oven and let them cook for 25 minutes. Place them on a tray/plate/whatever and serve with your fave condiment. I promise these will be a hit. 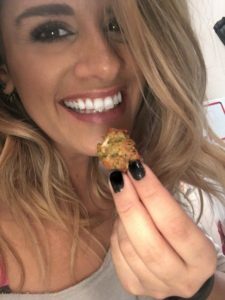 Even my boyfriend liked them, and I usually have to trick him into eating broccoli. 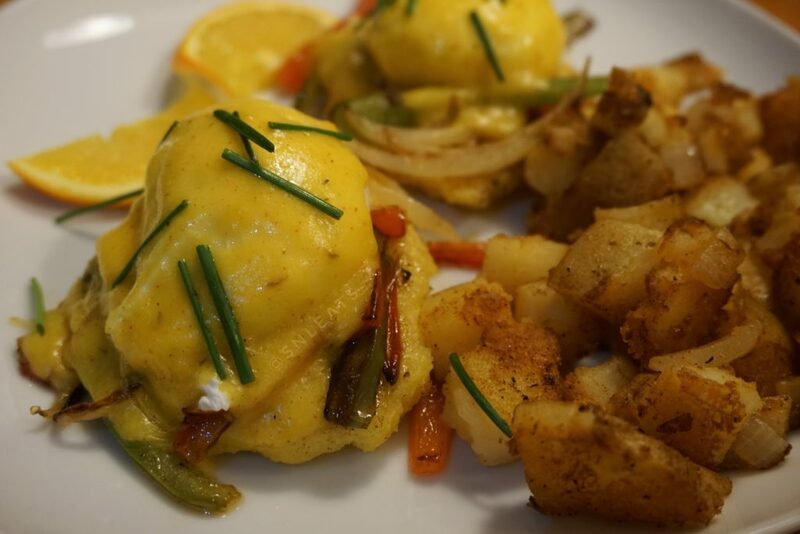 Brunch is about the celebration of food, fun, and friends. I had not felt like I had much to celebrate recently but that has changed in the last two weeks. As a result, I was ready for a fun-filled brunch with all my friends. 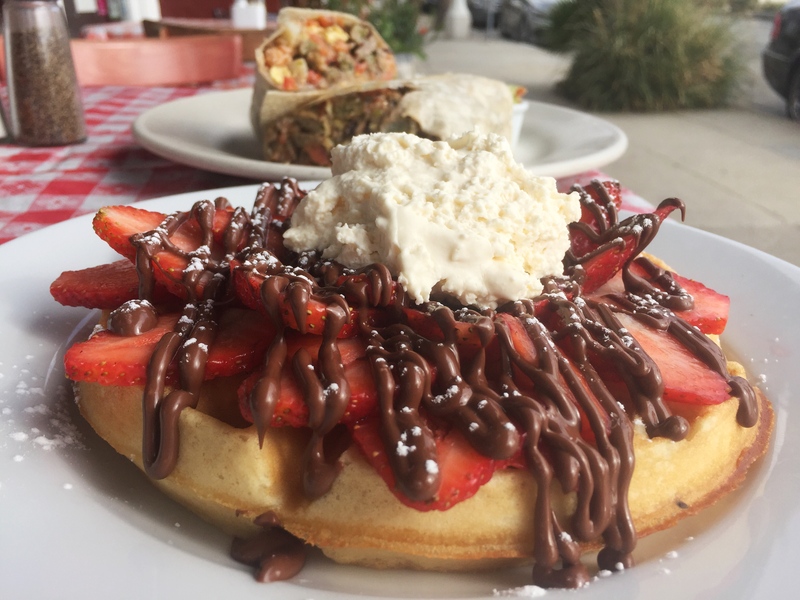 Since South Florida is home to many restaurants that offer yummy brunch menus, we had our work cut out for us in choosing the right place. 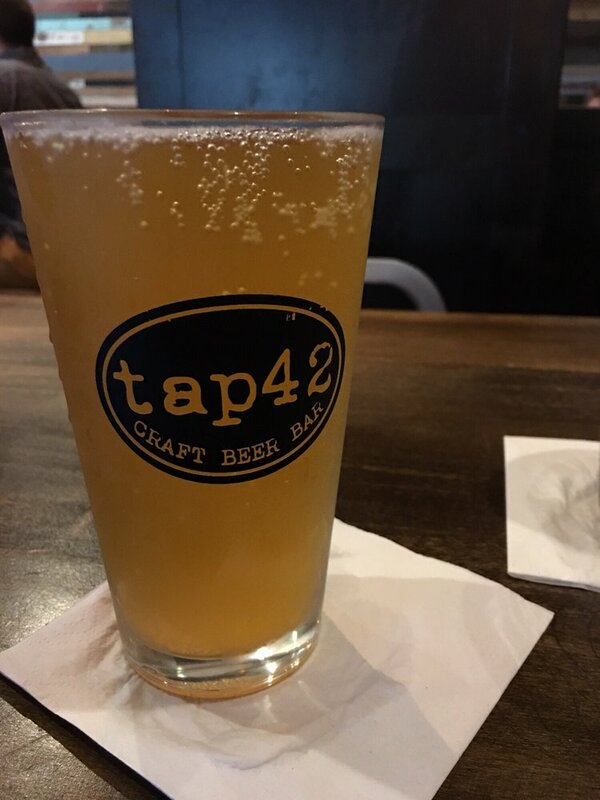 After a little back and forth, my friends and I decided on Tap 42 in Boca Raton. And did we ever! There were quite a few items that made the cut. One of my friend’s decided on the Bacon and Sweet Corn Guacamole, which came in the vegetarian option. Like you, we were expecting the guacamole to come as a dip with a side of chips or flatbread. However, many of the menu options at Tap 42 came in the form of a sandwich, and I can say my friend loved the variation. This option was no different. The Bacon and Sweet Corn Guacamole came as a piece of whole wheat toast topped with creamy avocado spread and cotija cheese garnished with charred corn, pink onions and fried garlic. A sunny side up egg sprinkled with all the fixings: cotija cheese, fried garlic, pink onions and charred corn completed the dish. We ordered what is perhaps the most well-known thing on Tap 42’s brunch menu: The Prohibition. It is a classic pub burger with a twist. 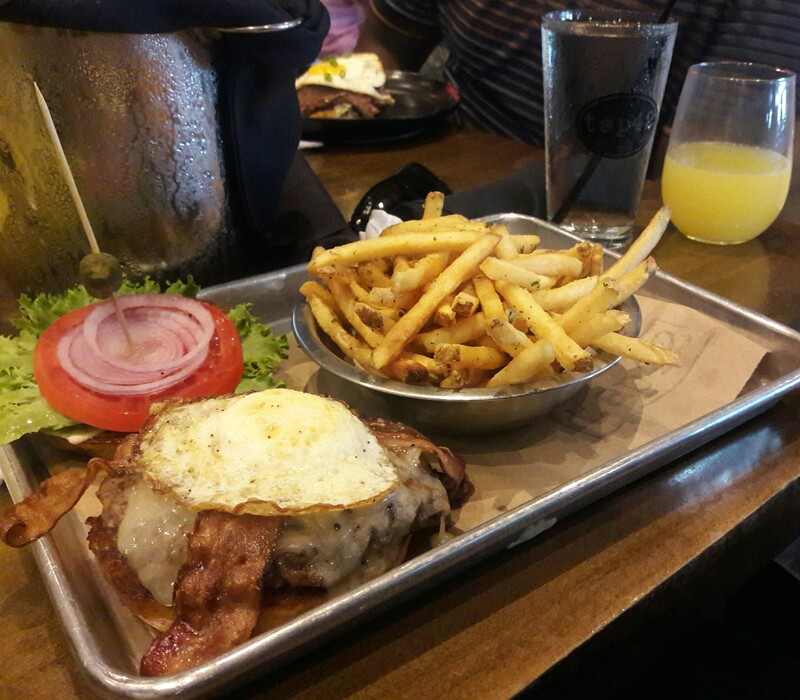 This mouthwatering burger comes topped with applewood smoked bacon, white cheddar, lettuce, tomato, onion, and dijonnaise along with Tap 42’s very own secret sauce. Of course, this would not be proper brunch sandwich without a over easy egg to complete it. 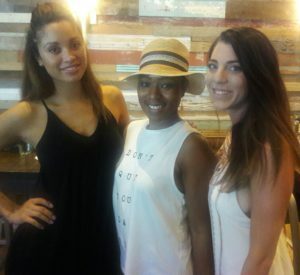 My friends and I would give Tap 42’s brunch menu two thumbs up. We loved it so much; we’re already planning our next trip back to taste some their 55 craft beer offerings. Yep. Despite the 42 in the name, this pub offers, even more, craft drafts that the name suggests. Can’t wait until our next time there! 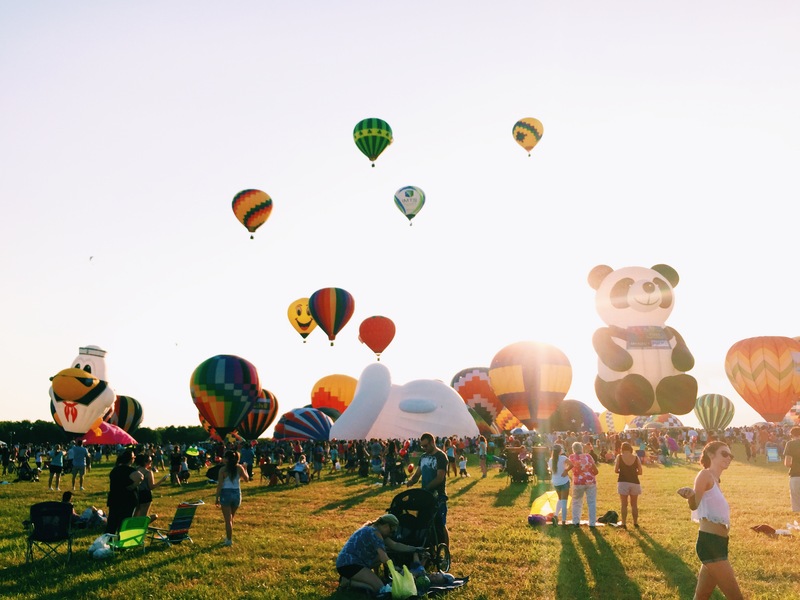 For all the New Jersey and tri-state dwellers, the QuickChek NJ Festival of Ballooning is one event of the summer you can’t miss! 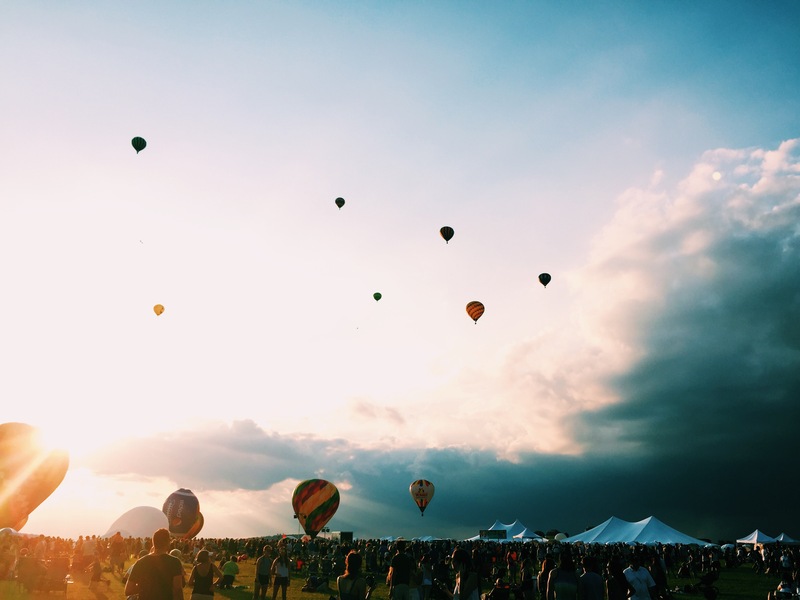 With live music, spectacular views, great food, and activities for every age group, it’s the perfect day out for squad and fam alike. 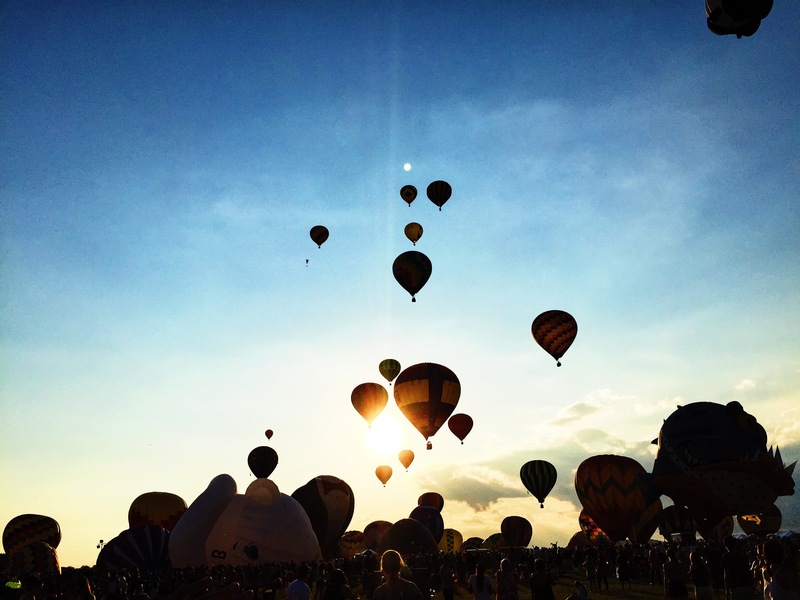 You can tour the inside of a hot air balloon, take a ride up if you have that kind of cash, and even witness a sparkly spectacle of a woman get shot out of a cannon. Why does she do this you may be wondering? It runs in the family of course. There are plenty of vendors on location to satisfy even the fiercest of munchies. 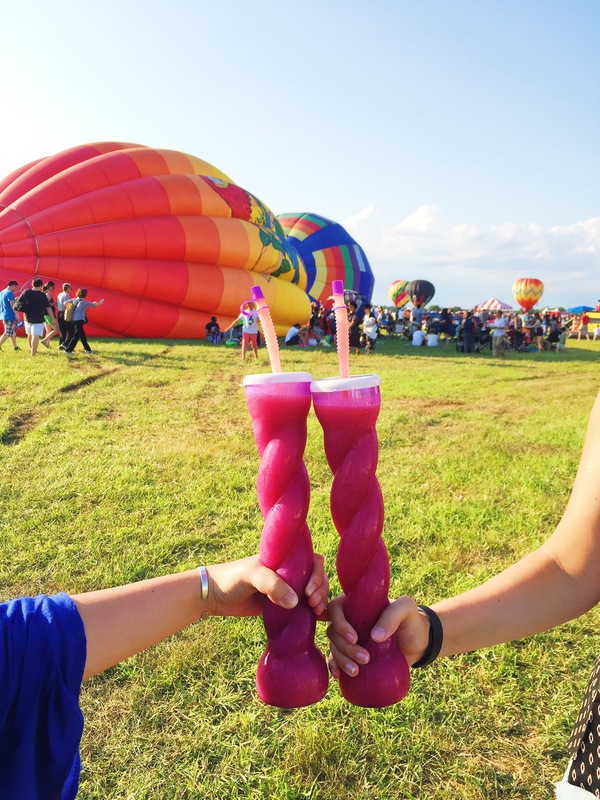 Our first indulgences were fresh strawberry banana smoothies in fun twisty souvenir cups. 2 cases of brain freeze later, we upgraded to a Philly cheesesteak and a cheeseburger. 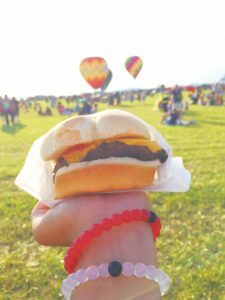 The vendors offered cheeseburgers, hot dogs, Italian sausages, gyros, falafel, crab cakes, funnel cakes, zeppoles, fried Oreos, and fresh squeezed lemonade. 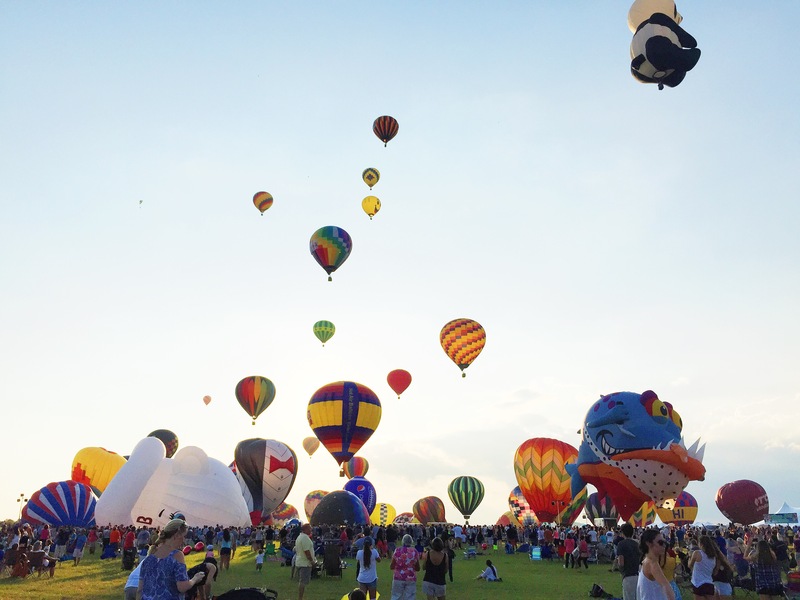 With happy bellies, we eagerly awaited the ascension of the balloons. Pandas, sailor ducks, and smileys oh my. Last but not least, this event offers plenty of cutesy photo-ops such as this. 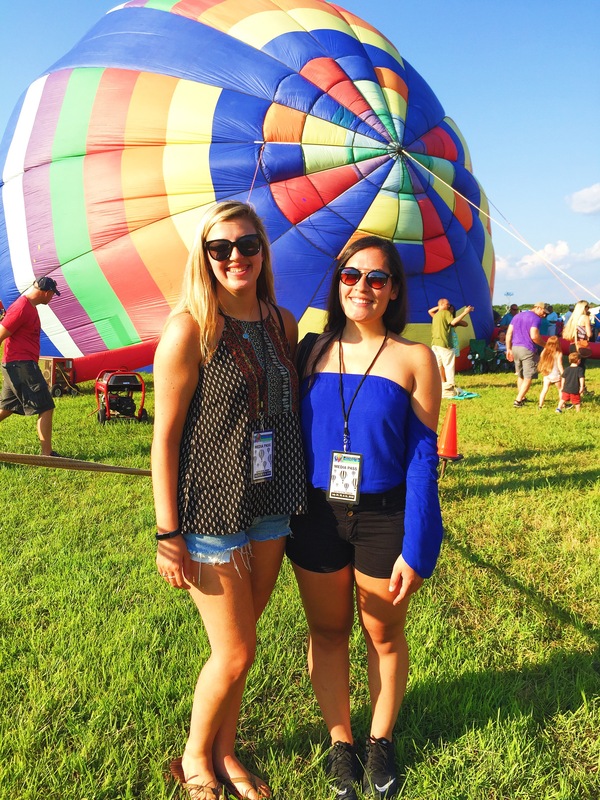 Thanks for checking out our post, we hope to see y’all at events in the future! I had the pleasure of meeting executive chef Nyesha Arrington (of Top Chef and Knife Fight) at a party/tasting celebrating the opening of her new spot Leona, in Venice. The tasting was fantastic and had me salivating for the opening. When I heard it was going to be located on Washington Blvd, I was a little apprehensive about that. I’ve lived Venice over 2 years now and I can honestly say, I never make it past Abbot Kinney Blvd. If you’re on Washington Blvd and move east toward Lincoln Blvd, there is a decent amount of ethnically diverse restaurants, as well as foodie favorites, but towards the beach, there’s more of a tourist trap vibe (The Whaler, Cabo Cantina, Islands). Leona sits a lot closer to the beach than the usual food blogger havens, so I had my guard up. Especially since the beachside of Washington Blvd. can be a little overwhelming with traffic on the weekends. 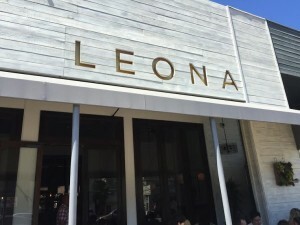 Luckily for us, Leona is a breath of fresh air for the beachside Washington Blvd scene. 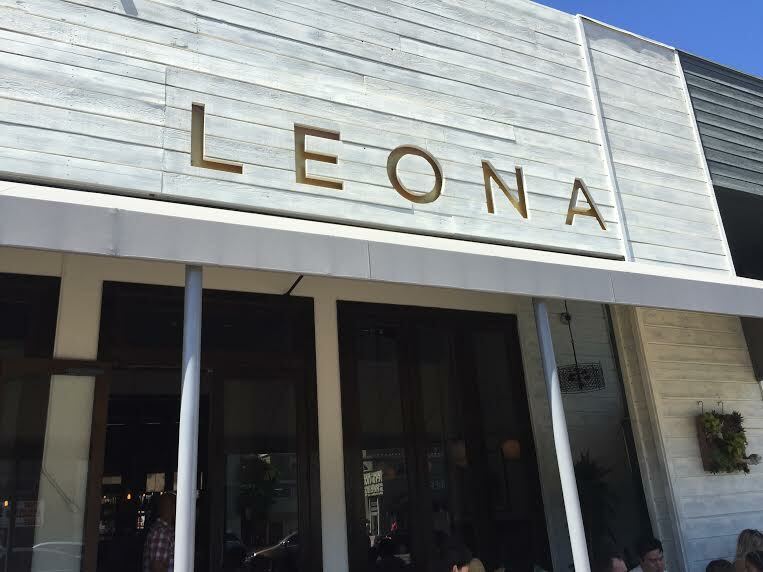 I hope Leona’s presence makes a big enough splash to bring in better culinary delights for this part of the block. 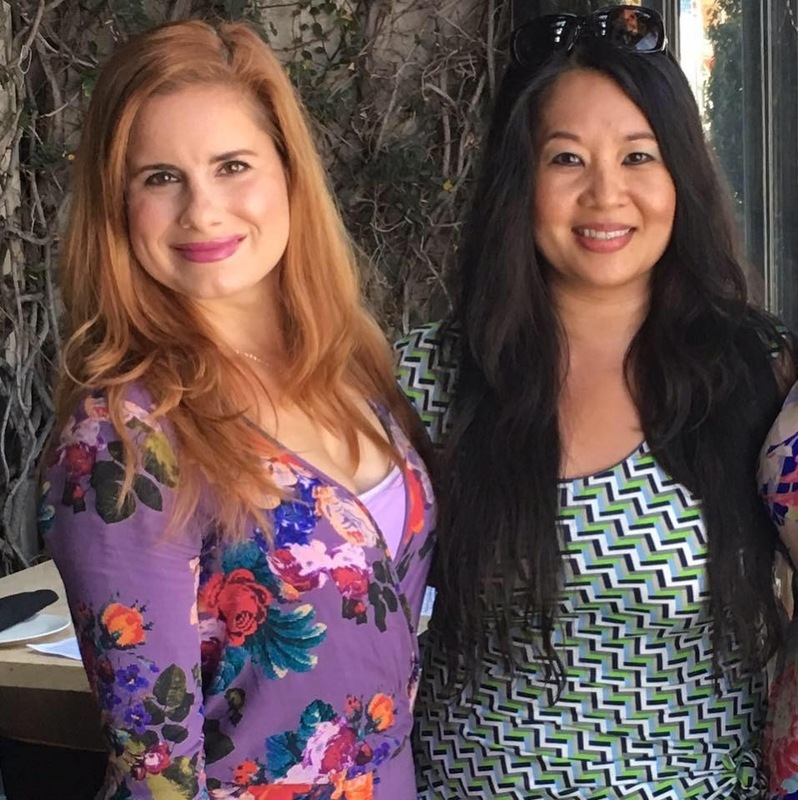 My girlfriends and I went to the soft open for their brunch over the past weekend and it definitely met the Girls on Food standards for a solid Sunday Funday. 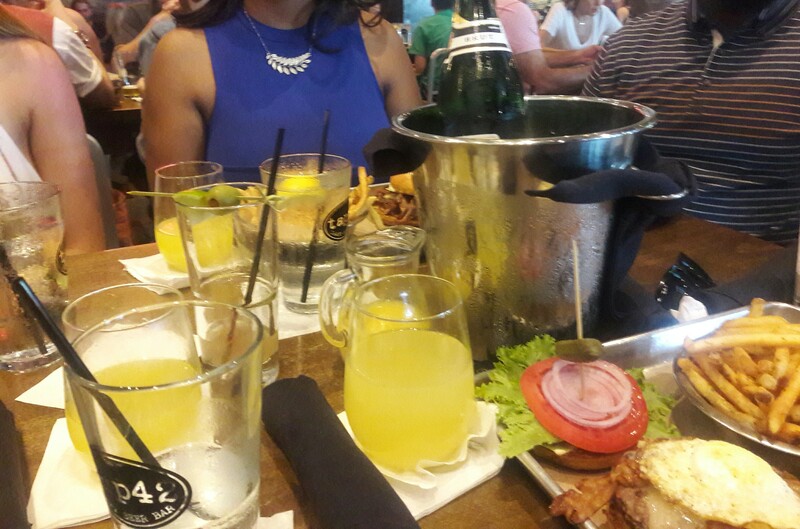 Mimosas, great food and a laid back atmosphere. Nyesha defines Leona as “California Progressive Cuisine”, and I think that’s a perfect description for the menu. The brunch items are appropriate to the current season with a melting pot feel of flavors, Italian, Dutch and Korean are represented. I was bummed out the infamous Chicken Brick that I have read so much about online wasn’t offered during brunch. It’s becoming a signature item (according to my online stalking), so I would’ve loved to have seen it incorporated in this menu. Maybe next time? Mimosas are mandatory for a girlie Funday. I had their peach mimosa and I love that it was delicately peach flavored; it didn’t have that overkill-syrupy taste a lot mimosas have. One of my friends had the passion fruit mimosa, which had a beautiful magenta color and also scored points with me for not being too sweet. These were great sweet spins on a classic drink. 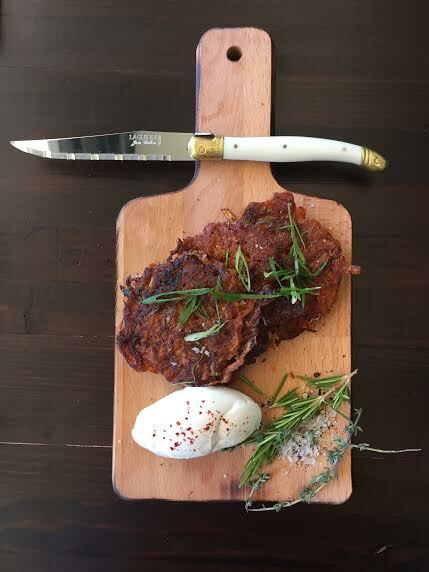 We started with Korean Latkes, a Jewish potato pancake with a kick. 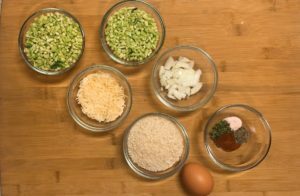 If you’re sensitive to spices, you should dip it in the dollop of creme fraiche provided before a bite. I loved the kick personally. I also gushed over the presentation. I love the offering of herbs, fresh pepper and sea salt to sprinkle on it. After our savory start, we shared Brown Butter Pancakes and California Benedict. The pancakes were to die for. They have that sweet and savory flavor combination that brings this foodie down her knees. The whipped coconut cream and sea-salt vanilla butter on top melt and get soaked up by the pancake, so there’s a buttery flavor to every bite. 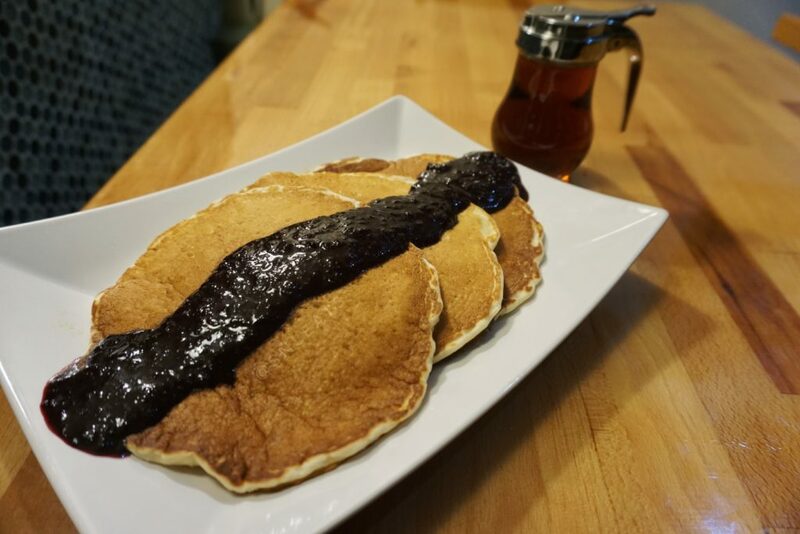 If you really love that sweet and savory flavor, order a side of their bacon and add that on top of your pancake. It’s smoky, very thick and has the right amount of fat. 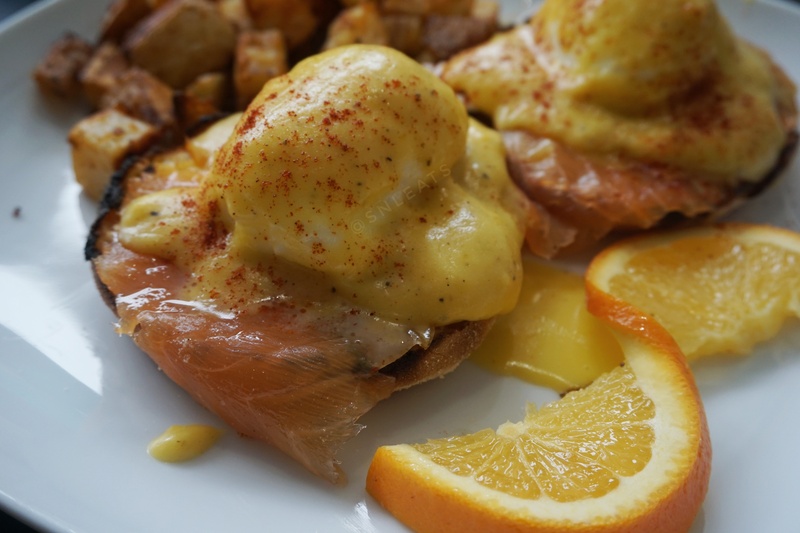 The California Benedict is aesthetically impressive plate and caters to coastal tastebuds. 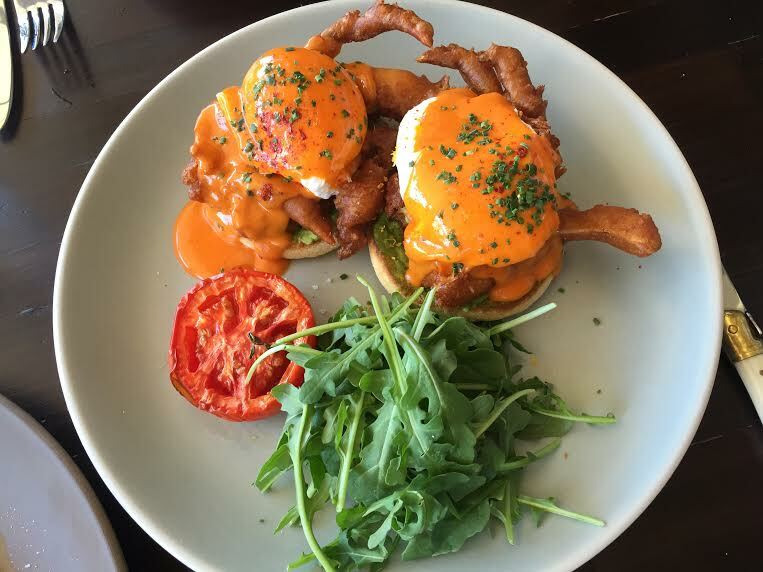 The fried soft shell crab rests on top an English muffin, with avocado and topped with poached eggs, then covered in a tomato hollandaise. I haven’t had soft shell crab added to a benedict before, so this was a unique treat for me. I recommend all Venice locals give the brunch here a taste and I’m looking forward to coming in for dinner. There’s a variety of seating here, ranging from indoor, outdoor, wine bar and countertop. These options cater to pretty much anyone. The atmosphere is very “California”, it’s nice, but there’s no pressure to dress up. Be prepared to either ride a bike or take an Uber here. Parking can cost up to $25 and there isn’t a valet system set up there yet. This spot is still technically in a soft open, so there’s time for them to find their legs.